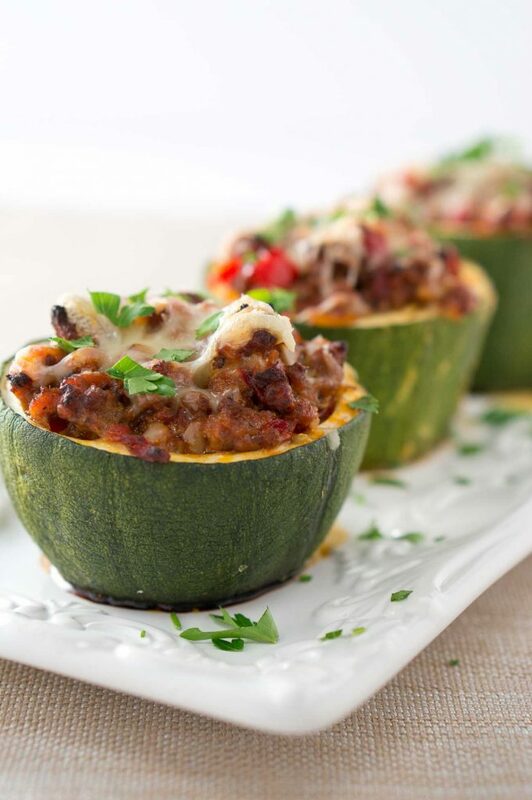 These stuffed zucchini cups are low-carb, naturally gluten-free and made with fresh summer ingredients. 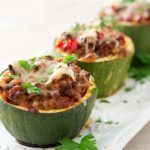 Hollowed out zucchini cups stuffed with a cumin spiced ground beef and delicious red bell pepper and onion mixture – baked in the oven with melted cheese on top – YUM! If you are like me and have so much zucchini, you don’t know what to do with it, try this recipe or check out my recipe for Stuffed Zucchini Boats with Garlic Sauce. They are both very delicious and make enough to feed a whole family. My husband picked some giant monster zucchini from the garden last week. I thought making stuffed zucchini cups will be perfect since the zucchini were so large and wide. I don’t think this recipe will work with zucchini regular size. They are not wide enough to hollow them out and stuff them with the meat and vegetable mixture. These stuffed zucchini cups are a perfect summer dish, and the recipe uses primarily seasonally fresh ingredients straight from the garden. This stuffed zucchini cups refrigerate well and can be reheated the next day for lunch, or stored in the fridge for few days. Heat 2 Tbsp olive oil over medium-high heat in a non-stick skillet. Saute chopped onion and pepper for about 3 minutes – until they start to soften. Add garlic and saute for 1 more minute, stirring occasionally. Move the vegetable mixture to a plate. In the same skillet, crumble in the ground beef and cook over medium heat until the meat is cooked through – about 7 minutes. Stir in vegetable mixture back into the skillet, add the tomato-basil sauce, and simmer until the mixture has thickened and liquid has cooked off – about 5 minutes. Cut zucchini in 2 inch thick slices, discarding the ends. Use a sharp spoon (or melon baller, or cookie scoop) to hollow out a hole in each zucchini slice, forming a cup, and leaving about 1/4 inch of zucchini flesh at the bottom. Be careful not to get too close to the bottom of the zucchini cup or the skin, otherwise, the stuffed zucchini cups will leak liquid when they bake. Place zucchini cups, open side up, on a foil-lined baking sheet. 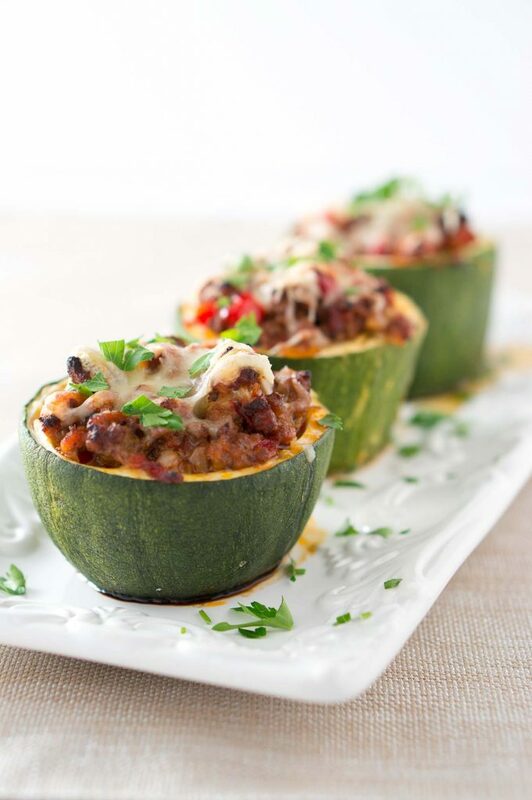 Stir 1/2 cup shredded cheese in the meat and vegetable mixture, then spoon the mixture into the zucchini cups, pressing down lightly with a spoon, and mounting it up a little over the top of the zucchini cups. Bake stuffed zucchini cups for about 30 minutes in a preheated 350 F oven. Then top with remaining 1/2 cup cheese, and continue baking for another 10 minutes, until zucchini is slightly soft when pierced with a fork and cheese is melted and lightly browned. 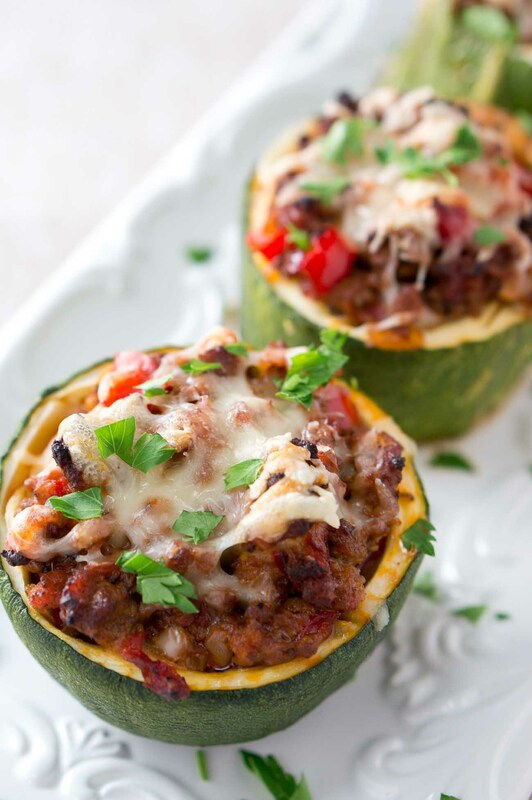 Stuffed zucchini cups made with a cumin spiced ground beef and delicious red bell pepper and onion mixture.Low-carb and naturally gluten-free. Heat 2 Tbsp olive oil over medium-high heat in a non-stick skillet. Saute chopped onion and pepper for about 3 minutes - until they start to soften. Add garlic and saute for 1 more minute, stirring occasionally. Move the vegetable mixture to a plate. In the same skillet, crumble in the ground beef and cook over medium heat until the meat is cooked through - about 7 minutes. Stir in vegetable mixture back into the skillet, add the tomato-basil sauce, and simmer until the mixture has thickened and liquid has cooked off - about 5 minutes. I ADORE THIS! They can be little appetizers or they can be entrees (if you eat like 15 of them, lol)! They look incredible 🙂 I want some meat now! They look great. And I love that there’s cumin in there – I adore it. 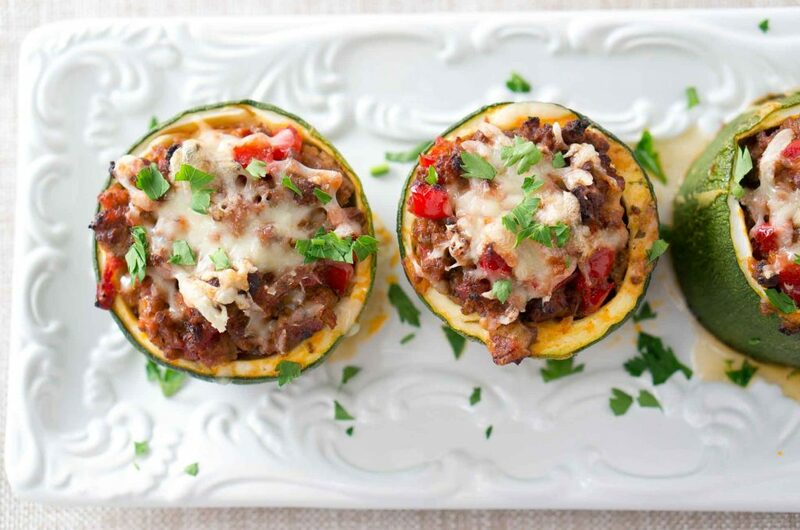 Love the idea of stuffed zucchini cups. What a wonderful dish for summer. The cumin-spiced ground beef must be so fragrant and lovely here! What a delicious and totally cute little summer dish. Perfect as part of the meal, or as an appetizer. Would work awesome on a brunch menu too. I’ve never seen a zucchini cup recipe before, only zucchini boats. And I have to say this looks way more elegant! Stop! you are making me so hungry! What a delicious idea for a party! I am saving this for later!